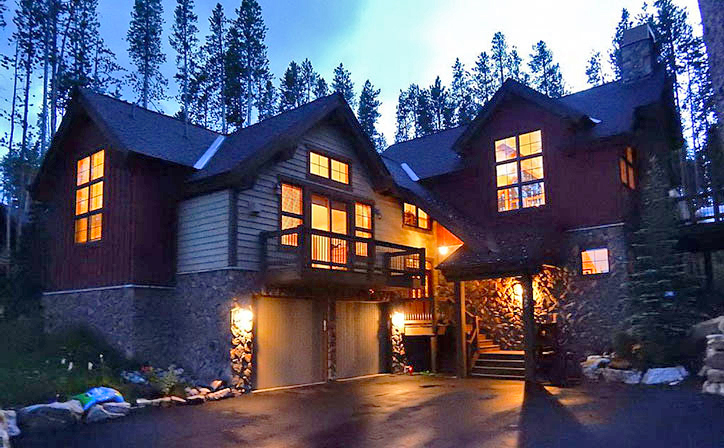 Highland Heaven Breckenridge Colorado Mountain Vacation Home is located in the prestigious Jack Nicklaus Golf and Ski neighborhood of The Highlands—one of Colorado’s best kept secrets in the backcountry of Breckenridge—Highland Heaven Breckenridge Colorado Mountain Vacation Home is the perfect destination for couples and families desiring a beautiful retreat just minutes away from an array of outdoor activities. 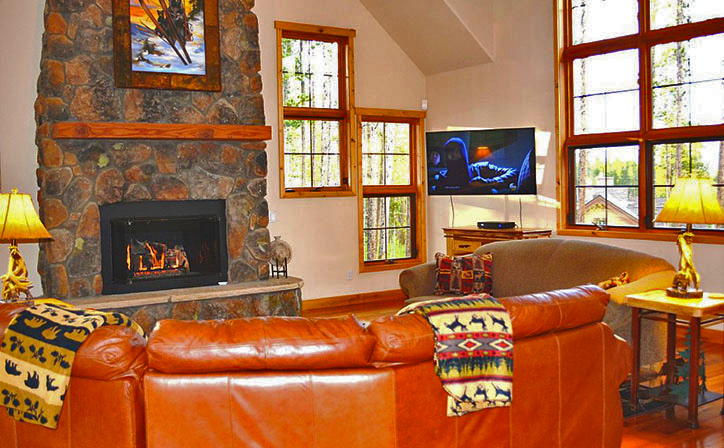 Highland Heaven Breckenridge Colorado Mountain Vacation Home is a stunning mountain vacation home that features nearly 4000 square feet of luxury living space with high-end finishes throughout on an acre of gorgeous wooded property. 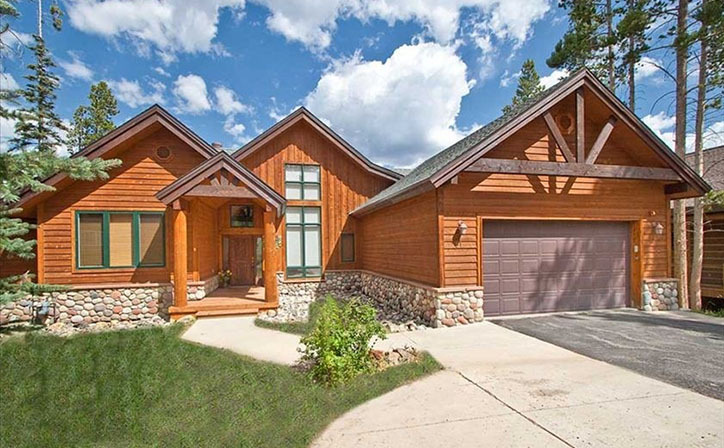 This custom-designed 4 bedroom / 4.5 bath masterpiece offers the secluded feel of a true mountain getaway, yet is conveniently located 5 minutes from downtown Breckenridge. 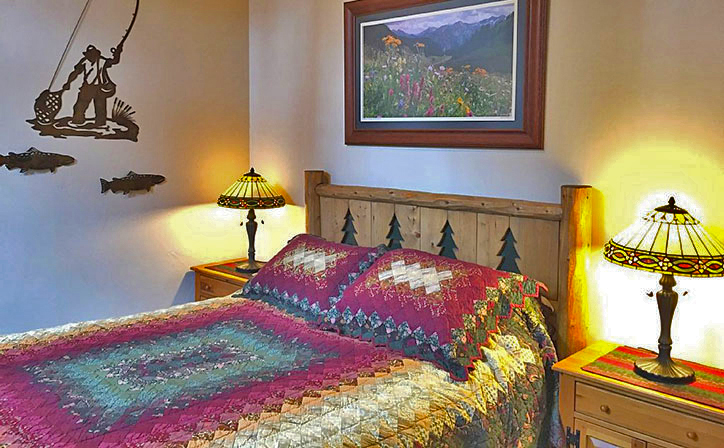 It combines amazing scenery with relaxed luxury and comfort, making it the ideal setting for your next Breckenridge vacation at Highland Heaven Breckenridge Colorado Mountain Vacation Home. We added a commercial 8 person boot and glove heater so that you will have warm, dry boots and gloves every day. With four exquisite bedrooms, each with their own private bathroom and storage, this home easily accommodates multiple couples or families who want to vacation together while having their own space. 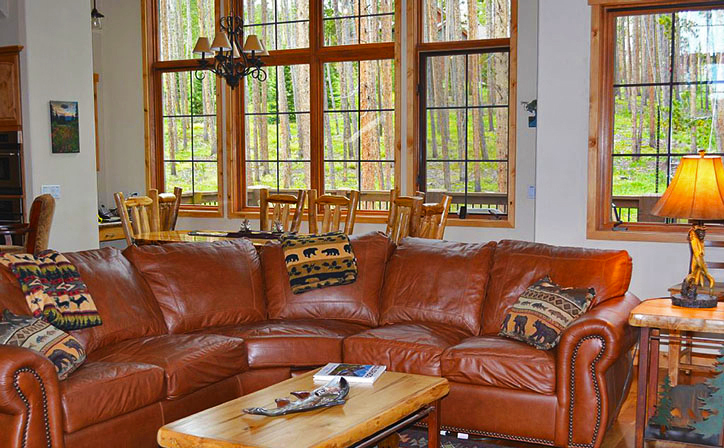 Highland Heaven Breckenridge Colorado Mountain Vacation Home is also packed with entertainment amenities, including multiple gathering spaces with flat-panel TVs, WiFi Internet throughout the home and downstairs, there is a den with comfortable couches and chairs, a gas fireplace, and a large flat screen TV for ultimate entertainment, a Foosball table and lots of games for the kids to play. On the Upper Level, you’ll find an elegantly-decorated, spacious master suite with a king size bed complete with a fireplace, and an expansive, private bathroom with double sinks, a gorgeous glass-enclosed shower, and a Jacuzzi tub with travertine marble throughout. On the same floor, there is a second bedroom that includes a queen size bed, a private bath, travertine tile, and breathtaking 10-foot, east-facing windows. 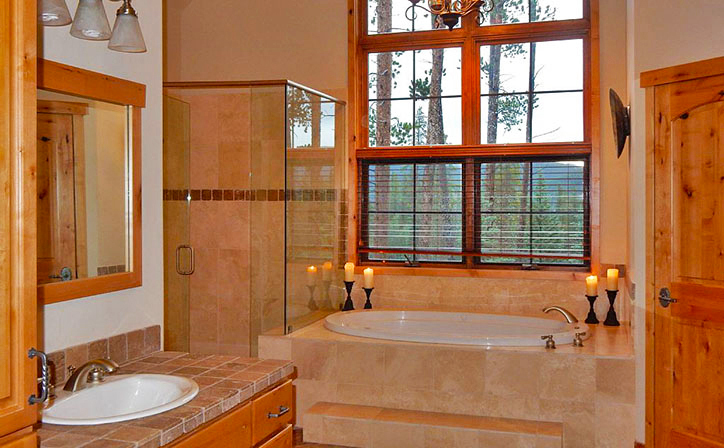 All bathrooms have in-floor radiant heating. Downstairs, there is a den with comfortable couches and chairs, a gas fireplace, and a large flat screen TV for ultimate entertainment. 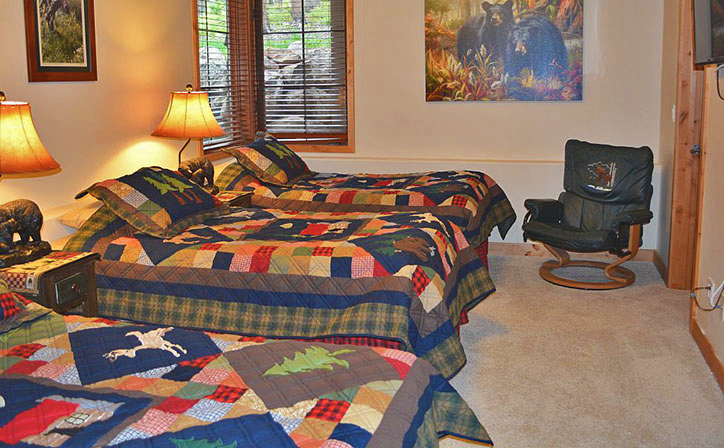 This level includes two spacious bedrooms, one with a queen size bed, and the other a queen size bed and two twin beds. Both bedrooms have their own private baths and storage. 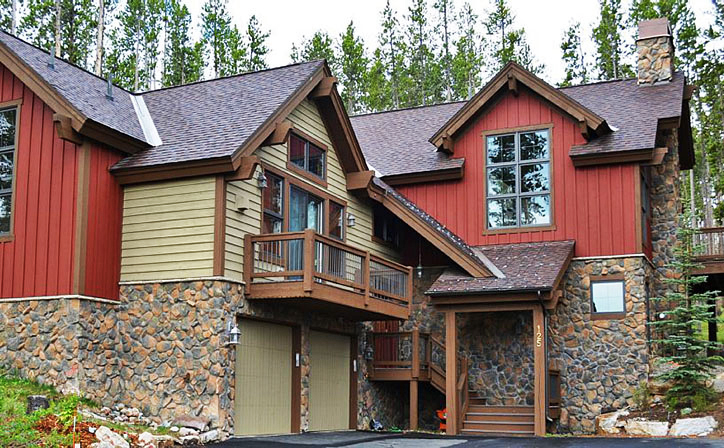 Highland Heaven Breckenridge Colorado Mountain Vacation Home has a laundry room with a full-size washer and dryer. There is an over sized, heated two car garage where you can store your skis and boards in the winter or your bikes and hiking gear in the summer. The home also has a snow/mud room for shoes and boots. The amenities are incredible! 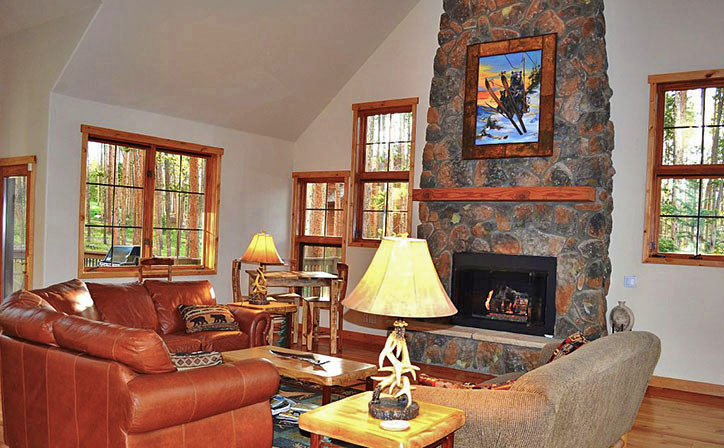 The spacious floorplan, vaulted ceilings, four bedrooms each with a private bath, spacious gathering rooms on two levels, and numerous amenities make this house an exceptional getaway in the mountains that is perfect for family vacations and quality time with friends. 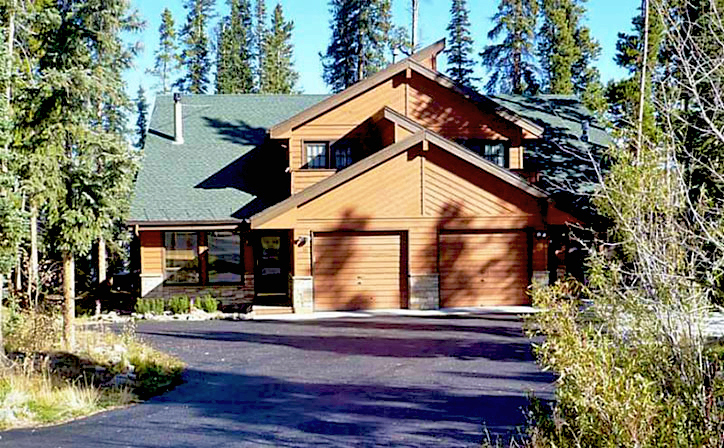 If you are looking for a private home in a beautiful setting with lots of space and easy access to all Breckenridge has to offer, then Highland Heaven Breckenridge Colorado Mountain Vacation Home will be the perfect place for you! 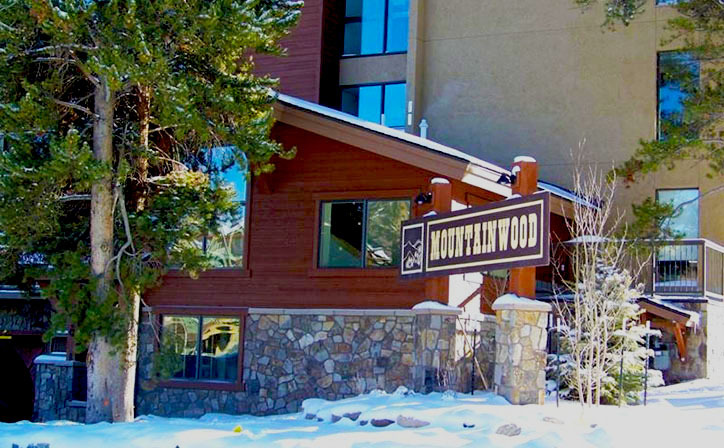 In the winter months at Highland Heaven Breckenridge Colorado Mountain Vacation Home, you can ski in the world-renowned Breckenridge Ski Area, just 5 minutes to the Gondola by car. Copper and Keystone Mountains are just 20 minutes away if you want to explore other skiing areas. There are many cross-country and snow-shoe trails nearby. Families with kids will enjoy sledding at Carter Park (our home has multiple sleds stored in the garage as a courtesy for guests’ use) and snow tubing at Frisco Adventure Park. Other winter activities include dog sledding, ice skating, snowmobiling, and sleigh rides. The possibilities are endless! 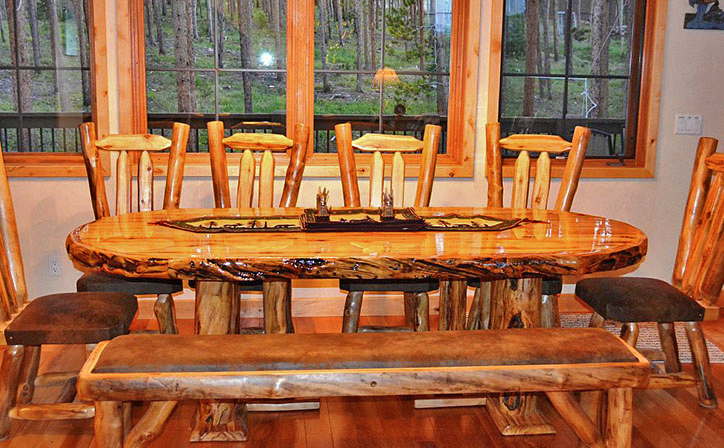 In the non-winter months at Highland Heaven Breckenridge Colorado Mountain Vacation Home, the Breckenridge area has an incredible trail system which will keep even the most avid mountain biker or hiker happy. Whether you want to explore the beautiful mountain views or search for wildflowers, you’ll be amazed at the variety of trails offered. For golfers, the 27-hole Jack Nicklaus-designed Breckenridge Golf Course is just a two-minute drive away. Four additional golf courses are within 30 minutes. If you like to fish, Breckenridge is home to world-class fly fishing on the Blue River, a crystal clear mountain stream. You can also spend a day on nearby Lake Dillon, which offers a wide array of activities like fishing, sailing, kayaking, windsurfing, paddle boarding, and boating. Whatever your interest, Breckenridge has something to offer everyone. You’ll make memories to last a lifetime! 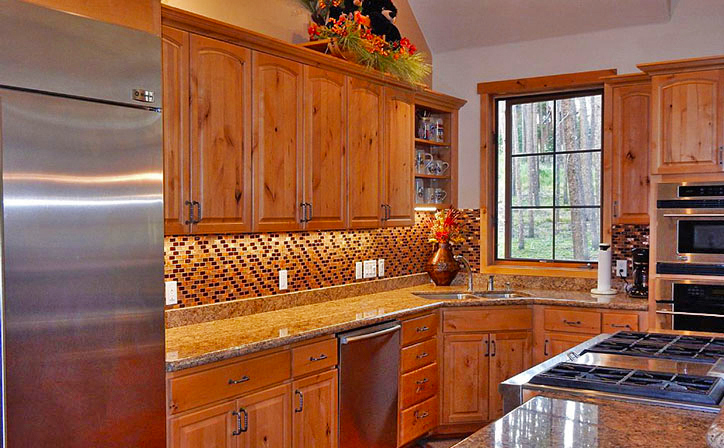 What Highland Heaven Breckenridge Colorado Mountain Vacation Home Offers! Outstanding accommodations from the furnishings to the hot tub from after playing golf all day!! Everything was perfect from check-in to check-out. This property is outstanding in every way. Upgraded furnishings, great location, in floor heating, a fantastic kitchen. We have been there in both winter and summer and enjoy it equally. Owners provide bikes and snow shoes. The flower gardens are a welcoming sight everytime you come back. We hope to come back many times in the future. Highland Heaven provided a perfect setting for our best family vacation ever! We rented this home with two other families. We were absolutely amazed when we arrived to see the beautiful views, an incredible hot tub on the deck, a stunning kitchen, and two family rooms. All the rooms had their own bathroom and closet! 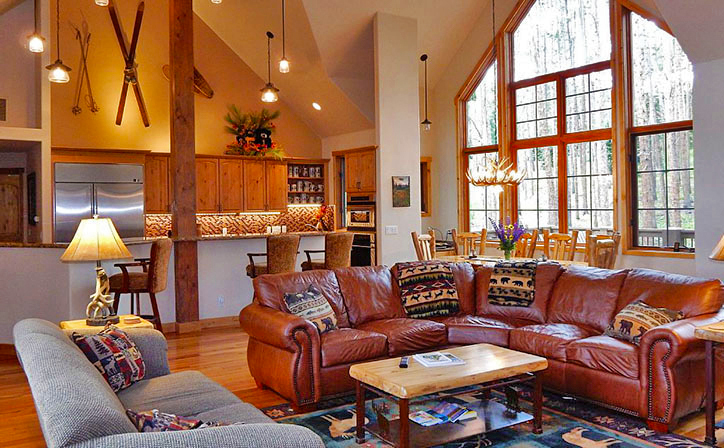 We came to ski, and it was the perfect house for our ski adventures-- boot warmers/dryers, ski storage, and baskets and hooks for all the snow gear. The kids had an absolute blast! They made snowmen in the driveway, went sledding on a local hill, played foosball downstairs, played various games at the game table, went in the hot tub multiple times a day, and did every snow activity imaginable - skiing, snow tubing, sleigh ride, and more. There was so much space in this house that we never felt crowded. We made some of the best memories ever. It was such a great mix of serene beauty and incredible adventures. We cannot wait to come back to this home!!! I cannot say enough about this place or the owner! I cannot say enough about this place or the owner! The owner was very helpful prior to our trip, giving a lot of information that we needed about the house and the local area. He was very informative about things we needed to know when traveling to a higher altitude. He gave us a lot of information about different points of interest in Breck that helped us in making decisions on what great activities we could do. The house is located in a beautiful area, close enough to town, but set up in a beautiful neighborhood with a tranquil view! It was easy to find and when we arrived everything was just as we pictured it to be. 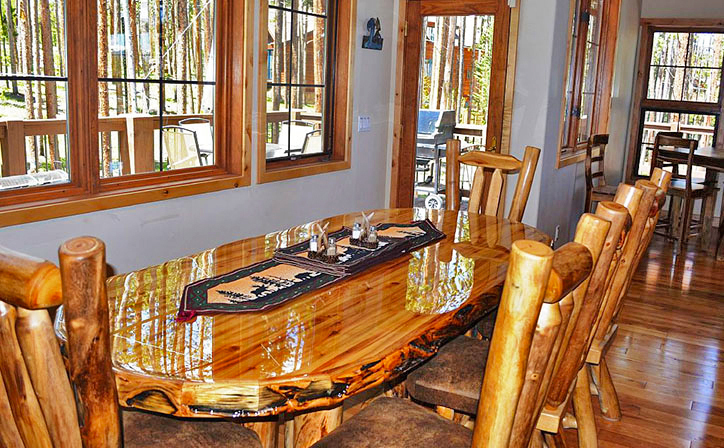 It is a beautiful home that easily accommodated our family of six. We wanted to find a place where everyone could have their own bedroom and bathroom located close to all of the activities. This was IT! Everything you needed was there. We had no trouble at all cooking our meals because all the utensils were right there. My husband was in heaven with a sub zero fridge and large gas stove. It was very clean and beautifully decorated. There was enough room for all of us to hang out and watch TV together or retreat to the bedroom where there was a TV in each plus the living room and the den. We felt right at home here and loved eating dinners at the huge kitchen table. After a long day of hiking and biking around Lake Dillon, it was so relaxing to sit in the Jacuzzi on the back porch and just feel like you are a part of nature. We could have sat there for hours reading a book and enjoying the peaceful tree lined property. I cannot say enough good things about this place. Like I said, everything we could have possibly needed was there and Bill was so helpful to us prior to our arrival. I loved Breckenridge and hope to be back this winter! I highly recommend this place to anyone who is going to Breckenridge. We have since recommended it to many of our friends. 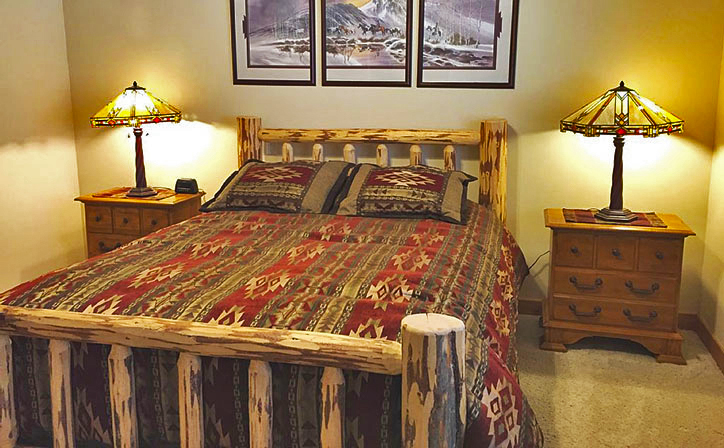 We were looking for a spectacular Rocky Mountain destination and classy home to suit 4 mature couples (with high standards), from various parts of the country on a reunion vacation. A hard order to fill, but Highland Heaven delivered! Four comfortable, well appointed rooms, and bathrooms for everyone to enjoy privately. Plus a perfect central living area, kitchen, and large deck for catching up with our dear friends. The large deck, and hot tub (really the entire property) are surrounded by trees, yet open to the sky for great mountain ambiance, day or night. The spa is large, immaculate, and was a frequent hub for our group. The location is adjacent an amazing 27 hole Golf Course, which we were able to play in the afternoon after a quick turnaround from hiking one morning. Close to downtown Breck for strolling/shopping/dining, (and the ski mountain), but just far enough away to be very serene and alpine. We saw deer and a fox in the woods right next to the deck! HH was perfect summer getaway for us, but we can't wait to come back for some skiing! Really a cool place, and a great value. Thanks Bill and Kathy, we'll be in touch! We stayed with a group of friends for a week. Could not believe how well appointed the home was. Everything in the kitchen to include a spice rack. Huge gas stove, wine cooler and a great setup. Bill & Kathy added a large Jacuzzi Brand Hot Tub on the deck. We watched the sunsets and hummingbirds in action. 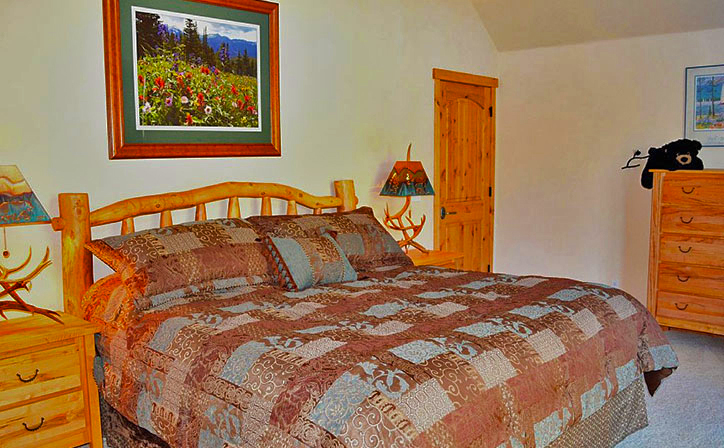 Our friends really like the private bathrooms in every bedroom and large comfy beds. All the homes have acre lots so there is lots of privacy. We were one of the first renters of the property, but I checked Bill out on www.vrbo.com/150312 and saw how easy he was to work with. I would definatley recommend this home. We were in awe of this home! We were in awe of this home! It is by far the best vacation home we have ever rented. First, it is stunning -- every detail has been accounted for, from the hot tub on the deck under the stars (heaven!) to the kitchen with everything a person could want for an intimate family dinner or a large group gathering. 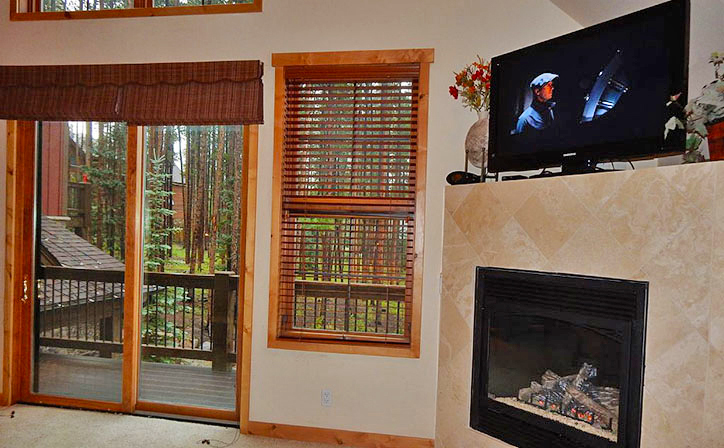 We loved how it provided a relaxing, serene setting in a beautiful wooded area right outside the town of Breckenridge but was easily accessible to everything. We used this location as a perfect home base for incredible wild flower hikes (we saw hundreds of different kinds of flowers! ), awesome mountain biking, area festivals, sight-seeing, fly fishing, and more. We have kids, and it was really nice that there is a second entertainment/gathering area where they can hang out and also have their own private rooms and bathrooms. This home has four bedroom and bath suites, so we can envision coming back with other families or couples too -- it would be great to be able to be together for meals, games, and relaxing, but also have our own space. The home has lots of storage and features that would make it easy for multiple families to vacation together. We sincerely loved this vacation home and look forward to coming back for skiing next winter and hopefully again next summer. 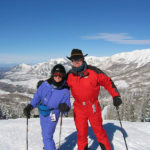 We also liked that the owners, Bill and Kathy, know Breckenridge really well and gave us a lot of valuable information about the town and activities. They were really easy to work with, and working with them made such a difference in the quality of our vacation. Thank you for helping make this such a special family time. It is one we will treasure for a lifetime!